Definity Linux was a Brazilian Linux distribution based on Slackware Linux. 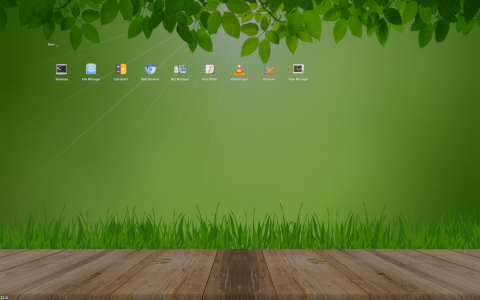 Rate this project Tomáš Matějíček has announced the release of Slax 9.5.0, the latest build of the project's minimalist and modular desktop Linux distribution based on Debian's "stable" branch: "Slax 9.5.0 released. I am happy to announce that a new version of Slax Linux has been released. Slax is a minimalistic, fully modular operating system. As usual, this version incorporates all upstream improvements from Debian stable, and fixes a few small known bugs. I am happy to announce that it is now possible to purchase Slax pre-installed on an USB flash drive with hardware-based AES encryption. This device is universally usable because encryption is performed directly on the drive and no trace of the PIN is left anywhere. Once disconnected, the USB drive automatically locks itself again. Payment is possible only with Bitcoin. You can download Slax from the project's home page. Enjoy!" Here is the brief release announcement with a screenshot and a photo of the above-mentioned USB drive. Download the Slax 9.5.0 live CD image from here: slax-64bit-9.5.0.iso (262MB, MD5, pkglist). Tomáš Matějíček has announced the availability of a new release of Slax, a distribution formerly based on Slackware Linux, but recently re-designed and built on top of Debian's stable branch. The new version, Slax 9.6.0, is the latest build; it brings the usual round of security and bug-fix updates, including a fix to the PXE boot support: "Slax 9.0 released. I am happy to announce that a new version of Slax Linux is available for download. It features updates for all included packages, and fixes PXE boot support, so it is now possible to boot Slax over network again. There is also a 'pxe' script included, which you can execute on a running Slax to start a pxe server (it will auto-assign a random IP address from range 10.0.0.x). In order to download Slax, visit the newly redesigned website at www.slax.org. Enjoy the new release!" Here is the brief release announcement as published on the project's newly re-designed website. Download links for the 32-bit and 64-bit builds can be found on the home page (MD5, pkglist): slax-64bit-9.6.0.iso (263MB), slax-32bit-9.6.0.iso (269MB). Separate iPXE images are also available - these can be used to enable computers without built-in PXE support to boot from the network. Slax is a live Linux distribution based on Debian. The Slax project has published a new version, Slax 9.4.0, which contains mostly package updates and bug fixes imported from Debian: "Slax 9.4 final released. After a short testing period with no problems reported, I feel it is now the right time to release a new version of Slax - a minimalistic, fully modular operating system. This version incorporates all upstream improvements from Debian 'stable', adds several default applications and fixes several known bugs. File manager now understands file types, so it is easier for users to open files like images, PDF documents, and so on. On top of all that, Slax now includes one-click-to-install launchers, to offer additional software to users while keeping Slax size small. If the current approach proves useful, Slax could contain lots of icons for additional programs, which will be simply installed (automatically) when launched for the first time." A list of changes between Slax's 9.3.0 release and 9.4.0 can be found in the distribution's changelog. Slax's ISOs and checksum can be found on the project's home page. Download the live CD image from here: slax-64bit-9.4.0.iso (260MB, torrent, pkglist). Slax is a Debian-based distribution designed to be run from a USB flash drive. The project has released a new version of the live desktop distribution carrying the version number 9.3.0. The new version's major change is the introduction of additional firmware for wireless networking devices. "Lets recap all the changes since previous stable version: First of all, I've added lots of firmware drivers to support various WIFI devices. It is around 40MB compressed, so Slax is a bit bigger now due to this, but I fully understand that a computer without network connection is completely useless, so this had to happen. I spent some time testing Slax to boot from many different file systems and I was able to identify some problems, which are now fixed. Most importantly this includes NTFS and ext4 support, so Slax is now capable of booting from them as well." Further details can be found in the project's release announcement for Slax 9.3.0. ISO images can be downloaded from the distribution's home page. Download: slax-64bit-9.3.0.iso (256MB, pkglist). Following a long absence, the Slax project has returned and the new version, Slax 9.2.1, features several significant changes. Slax no longer uses Slackware as its base, the project is now built using Debian packages. With this migration to Debian, Slax will also adopt the APT package management tools and the systemd init software. "After several years of inactivity Slax project has been brought to life again. For those who did not hear about it yet, Slax is a little distribution of GNU/Linux (in 200MB), which runs on your computer without installing, and makes no changes to it (unless you tell it to do so). This time, Slax uses Debian stretch as its base, and thus it can offer all the wonders of the mighty 'apt' command. If you are missing any software in Slax, use 'apt install SOFTWARENAME' to get it in an instant. I've decided to go for Debian because it made my life much easier and I believe that it will make yours too. Graphical desktop uses Fluxbox window manager and xLunch, which was written especially for Slax and with Slax needs in mind. Furthermore the development of xLunch continues independently." Further information can be found in the project's release announcement. Download links and MD5 checksums can be found on the project's home page. Download: slax-64bit-9.2.1.iso (208MB, pkglist). Tomáš Matějíček has announced the release of Slax 7.0.6, an updated version of the Slackware-based live CD with a minimalist KDE desktop: "I'd like to announce an update of Slax live Linux, version 7.0.6. The main changes are the new Linux kernel 3.8.2 and updated KDE 4.10.1. It was a bit harder than I expected, mostly due to some really odd changes made by KDE developers, which I had to work around to get the same functionality as we are used to. Raw changelog: fixed missing notification when module is activated or deactivated; upgraded all packages to reflect changes in Slackware 'Current'; Updated Firefox to 19.0.2; show date on taskbar under current time; the device notifier in KDE is now hidden since it was showing on mad positions. The Slax size has increased by about 3 MB due to new stuff provided by KDE." Read the full release announcement for more information. Download: slax-English-US-7.0.6-x86_64.iso (226MB, MD5). Update: a bug-fix version 7.0.7 is now available. And 7.0.8. Tomáš Matějíček has announced the release of Slax 7.0.4, the latest update of the project's Slackware-based live CD with KDE: "A new version of the Slax pocket operating system has been released. Improvements and fixes include: added 'load=' and 'noload=' boot parameter support to filter loaded modules; better bootinst.sh compatibility with Ubuntu and its clones; PXE now tries to get Slax data over TFTP (from the same server) if HTTP connection to port 7529 fails; fixed a bug which appeared when using from=... to load Slax from a path which included a directory with two letters; fixed URL open in KDE, so clicking a link in Pidgin for example opens it in Firefox instead of downloading the URL by KDE kioslave; support for special files in Slax bundles; the autobuild system now adds a file /run/requires to all modules which require other modules...." Read the rest of the release announcement for a complete list of bug fixes. Download (MD5): slax-English-US-7.0.4-x86_64.iso (219MB). Tomáš Matějíček has announced the release of Slax 7.0.3, an updated release of the project's Slackware-based live CD: "A new version of Slax is available for download. This release adds several new features and fixes a few bugs as well. Probably the most interesting feature is PXE boot support and improved X auto-detection. All modern computers nowadays support PXE, which allows booting an operating system over network interface independently of data storage devices (like hard disks). Slax fully supports PXE booting now. How to do that? One computer will act as a server, so just boot Slax on it from CD or USB and make sure to have the appropriate boot menu option 'Act as PXE server' checked. Slax on the server computer will provide DHCP, TFTP and HTTP services to enable PXE booting for other computers on the network." See the full release announcement for a list of new features and changes. Download (MD5): slax-English-US-7.0.3-x86_64.iso (219MB). Tomáš Matějíček has announced the release of Slax 7.0.1, a bug-fix update of the Slackware-based live CD: "For those who can't leave their computers even during Christmas (as I am apparently one of them), here is an update for Slax, version 7.0.1. Changes include mostly bug fixes, kernel upgrade, Broadcom SoftMac support, and textmode support for keyboard mapping and fonts. Raw changelog: Fixed double-click on location bar in Firefox; fixed Slax buildscript download, it was not working in a subdirectory with spaces; introduced bashrc with colors for Konsole; Xterm no longer needs helper in xterm.bin,; allow underscore and plus sign characters in buildscript names; fixed deactivation of modules which were activated automatically during boot; upgraded to Linux Kernel 3.6.11...." Read the brief release announcement for a complete changelog. Download (MD5): slax-English-US-7.0.1-i486.iso (213MB), slax-English-US-7.0.1-x86_64.iso (220MB).